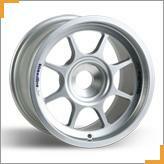 Cast Aluminium alloy. Single seater race wheel. The precise casting technique used to produce this wheel has allowed us to offer a wheel that represents an excellent combination of durability, strength, stiffness and price. Employed by many single seater chassis manufacturers worldwide, including Signatech ( Renault Campus ) and Radical Motorsport.